GLENS FALLS, NY - The Adirondack Thunder used two goals from James Henry and 31 saves from Alex Sakellaropoulos to help take down the Maine Mariners 3-2 on Wednesday night at Cool Insuring Arena. After Mariners defenseman Brycen Martin gave Maine a 1-0 lead, Thunder forward Peter MacArthur tied the game at 17:19 of the opening period. Adirondack had great puck movement on the man advantage, and after MacArthur rang a shot off the iron earlier, he finished a one-timer off a beautiful spinning drop-pass from Kevin Lough. 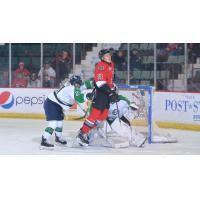 The score was MacArthur's sixth of the season while Lough and Shane Conacher collected the helpers. It was the James Henry show to start the second period as the Thunder captain scored a pair of goals just two minutes apart in the middle frame. First, Henry gave the Thunder a lead with a shorthanded tally when he faked going behind the Maine net and snuck out in front with a quick move to beat Mariners goalie Connor LaCouvee. Mike Szmatula set Henry up with a great forecheck before the sixth-year pro went far side for a 2-1 Thunder lead. Henry's second goal was a little unorthodox but they all count the same. After MacArthur took a tour of the Adirondack offensive zone, he slid a pass to Blake Thompson at the right point. Thompson fired a slap-shot looking for a deflection and instead got two. Jakob Reichert got a redirection with his stick and the puck proceeded to hit Henry on the leg in front of the net and trickle in for a 3-1 Adirondack advantage. Former Thunder forward Terrence Wallin brought the Mariners within a goal at 7:27 of the third period when he chipped a backhand shot over Sakellaropoulos' shoulder. It was Wallin's fourth score of the season in his first game since being sent down from the AHL's Hartford Wolf Pack. Sakellaropoulos shut the door the rest of the way to preserve the Thunder victory as they ended their three-game skid on home ice. The former Union College goalie finished the night with 31 saves, saving his best effort for early in the third period when he paddled a puck away that was sitting on the red line to keep what was then a two-goal Thunder lead. LaCouvee was impressive for Maine as he finished the night with a whopping 40 saves. The two sides will meet again Friday evening, this time from Cross Insurance Arena in Portland, ME. Adirondack will return home after the rematch to take on the Brampton Beast Saturday night back in Glens Falls. Saturday is the Thunder's annual coat drive as well as the first post-game skate of the season, presented by Glens Falls Hospital. For the most up-to-date Thunder news, follow the team on Facebook and Twitter (@ECHLThunder).